Math is hard, let's try programming! We've seen that if you use a quoted line of text as argument to println function, it will display the quoted text. 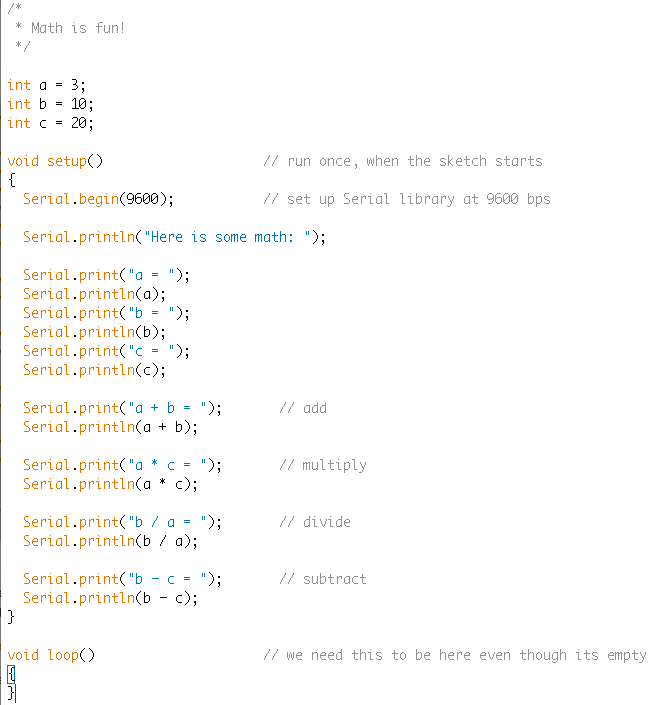 If you don't include the quotes your Arduino sees the argument as a variable and the println will look up what the variable contains and print its value instead. So in this case we would not see a in the Serial Monitor, but instead we would see 3. Note that we're using 2 different serial functions here, the original println and now also print. The print function is just like println except it does not print out a "carriage return" at the end, starting a new line. 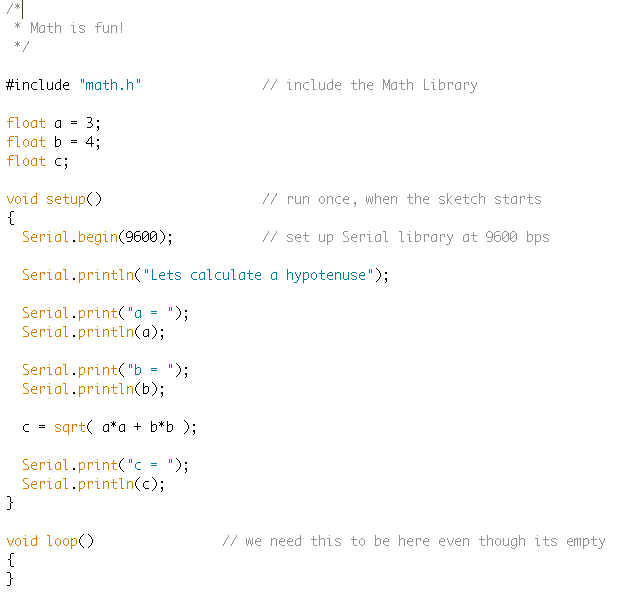 So, a = would print in the Serial Monitor and then be followed by 3 on the same line. You can experiment with changing the print's to println's and looking at the Serial Monitor to see how it looks different. In this case, the Arduino looks at what the argument to println is, and finds it's actually a calculation. It looks up what a is (3) and what b is (10) and then adds them together (+). It then uses that as the value to send to println. You may have noticed that for multiplication we used an asterisk instead of an x. Since x is a letter computers would never know when you want the letter and when you intend to multiply so instead we use an askerisk as our multiplication symbol. When we look at the results for b / a in Serial Monitor we see the result isn't very precise. So far we've only been working with integers, which if you recall, are whole numbers. If the variables we are calculating with are integers then our answer will be an integer as well. If there are decimals they will simply be dropped from the result. When you upload and run your sketch you'll notice that everything has decimals now and we can get an actual answer to "b / a". We can use our Arduino as a simple calculator, but let's get a little more sophisticated. Let's calculate the length of the hypotenuse of a right triangle. If you remember from math class, if you have a right-triangle, the hypotenuse c can be calculated from the lengths of the two legs, a and b. Which basically says "We'd like to use the math functions, which are in a library that requires us to include the file math.h where the sqrt function lives". This gives us more than sqrt, but we don't need to know that right now. The second thing that's different here is that when we create the variable c we don't assign it a value. It turns out that this is totally OK, it just means that we don't know what c is going to store yet, because we're going to calculate it later. Since it's not assigned to a value upon creation, the Arduino just creates the box, the stuff inside is whatever was in left over in memory. If you don't assign a value to a variable, then it will be given a default value of zero. Later on in the sketch, we assign it the value. In this line, we square a and b and then add them together, then we call the sqrt() function (which does exactly what you may think), to take the square root. Then we assign that to the variable c. Whatever was in c before is lost, replaced by the new value.